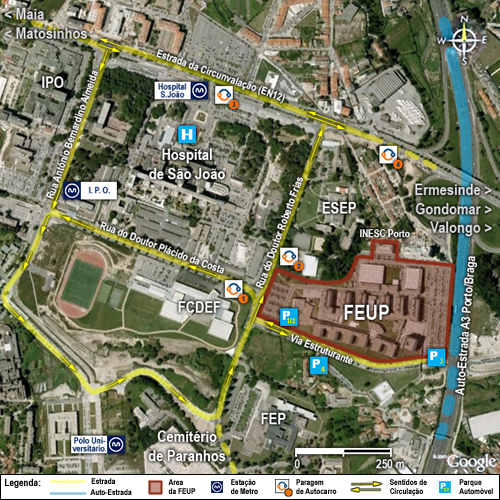 FEUP is located in Portugal, on the northern edge of the city of Porto, near the Circunvalação ring road (EN12) and next to Hospital de São João. If you have installed Google Earth’s software, you can download and open the file FEUP.kmz to see FEUP’s location. If not, you will first have to install Google Earth (available at http://earth.google.com). FEUP is served by three Metro stations on line D (yellow) in zone C6. Line D (yellow) connects the University Campus station Polo Universitário to Gaia City Hall in about 15 minutes, via Trindade, where it connects to line A (blue), line B (red) and line C (green). Leaving the Polo Universitário station, you should turn left into Rua Dr. Manuel Pereira da Silva and then, after passing Paranhos cemetery, turn left into Rua Dr. Roberto Frias. Go straight on and you will find FEUP on your right. Leaving the IPO station, you should go on down to the end of Rua Dr. Plácido da Costa and cross Rua Dr. Roberto Frias. You will then be in front of FEUP. Leaving the Hospital de São João station, follow the Circunvalação ring road until you come to the junction with Rua Dr. Roberto Frias. Go down that road until the junction with Rua Dr. Plácido da Costa. FEUP will now be on your left. For more informations, consult Porto Metro Network Map (PDF Format). There are 4 bus lines in the Faculty’s zone: 204, 300, 301 and 803. There are other STCP bus lines from Hospital de S.João, as well as regular bus routes to other cities. In order to choose the best bus routes for your needs, visit the website: www.stcp.pt. You should follow the EN12 until you find Hospital de São João on your left. Go straight on at the traffic lights with Rua Dr. Roberto Frias and keep left. At the next traffic lights, turn left into Rua António Bernardino Almeida (the IPO will be on your right) and go straight on across Rua Dr. Plácido da Costa. Keep left until the next junction, where you should turn left. Go down this road until you reach another junction where you should turn left. Go to the end of the road and at the junction at the end, turn left into Rua Dr. Roberto Frias. Keep right until the junction with Via Estruturante, where you should turn right. You should follow the EN12 until you find the IPO on your right. Enter the right lane at the traffic lights in order to turn right into Rua António Bernardino Almeida (skirting round the IPO). Go straight on through the junction with Rua Dr. Plácido da Costa. Keep left until the next junction, where you should turn left. Go down this street until you reach another junction where you should turn left. Go to the end of the road and at the junction at the end, turn left into Rua Dr. Roberto Frias. Keep right until the junction with Via Estruturante, where you should turn right. FEUP has three car parks skirting its south perimeter, all of which are accessed from Via Estruturante (which runs at right angles to Rua Dr. Roberto Frias). Access to the car park for non-permanent staff members. If you are arriving from Campanhã station, you should catch the Metro and choose any one of the following lines: A (blue), B (red), C (green) or E (purple). You will have to change at Trindade station to catch Line D (yellow). You should then follow the directions given in the option “By Metro”. If you are arriving from S. Bento station, you should take Metro Line D (yellow) and then follow the directions given in the option “By Metro”. The quickest way of getting to FEUP from the airport (if you do not have transport waiting for you or do not intend to catch a taxi) is to take Metro Line E (purple) into Porto. You will need to change at Trindade station and take Line D (yellow). Then follow the directions given in the option “By Metro”.